Douglas Carr is NBAA’s vice president of regulatory and international affairs. In this position, he is responsible for leading the association’s broad regulatory agenda affecting business aviation safety, security and operations in the United States and around the globe. He also is the staff liaison for NBAA’s International Operations Committee. In April 1998, Carr joined the NBAA staff as manager of domestic operations. He subsequently was promoted to manager of safety and operations and director of government affairs. In these positions, he monitored and responded to domestic regulatory and legislative initiatives by Congress, FAA, TSA and other government agencies. He also provided operational-related assistance for on-demand air carriers and privately operated aircraft. Carr has distinguished himself at NBAA by leading the Association’s effort on the Fractional Ownership Aviation Rulemaking Committee (FOARC) to develop recommendations for the FAA and as the chair of the FAA’s Part 125/135 ARC Flight and Rest Subcommittee and leading the industry’s response to the Transportation Security Administration’s (TSA) Large Aircraft Security Program proposal. Additionally, he chaired the FAA’s Takeoff and Landing Performance Assessment Aviation Rulemaking Committee and led the industry’s effort to develop updated duty and rest requirements for on-demand charter (Part 135) operations. Internationally, Carr has represented business aviation interests at the International Civil Aviation Organization (ICAO) and as part of several rulemaking efforts at the European Aviation Safety Agency. 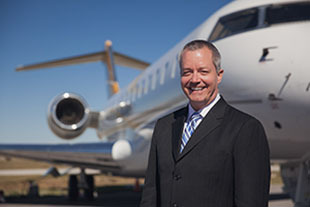 He serves as the corporate secretary for the International Business Aviation Council. Carr is a graduate of Southern Illinois University at Carbondale, where he received a Bachelor of Science degree in aviation management and an Associate of Science degree in aviation flight. Prior to his college years, he spent six years in the U.S. Navy. As part of his military duties, he worked onboard a nuclear-powered submarine where he was responsible for many aspects of the submarine propulsion system, including the operation, maintenance and repair of the nuclear reactor and support systems. Before joining NBAA, Carr was employed by the National Air Transportation Association as a specialist in government and industry affairs. There, he was responsible for issues affecting FAR Part 135 on-demand air carriers and flight training providers. Carr is a commercial, multi-engine, instrument-rated pilot and a certificated flight instructor.